The African Union’s Peace and Security Council (PSC) certainly has a lot on its plate. With the war in South Sudan, the escalating crisis in the Central African Republic (CAR) and major challenges in North Africa, the 14 members of the PSC have more than enough to keep themselves busy. Yet, analysts are urging the PSC not to drop the ball when it comes to Guinea-Bissau – one of Africa’s few lusophone countries and a member of the worldwide Community of Portuguese Language Countries (CPLC). International response to the crisis has so far been marked by disagreement between the African Union (AU) and the Economic Community of West African States (ECOWAS), according to the soon-to-be-released March issue of the Institute for Security Studies’ (ISS’s) monthly PSC Report. Guinea-Bissau has been going through very tough times following the coup against former prime minister Carlos Gomes Júnior on 12 April 2012. After being postponed several times, presidential and parliamentary elections are now slated for 13 April; polls that the international community hopes will end two years of crisis and instability. ‘The PSC should encourage AU representation in Guinea-Bissau to continue meeting with all political actors in collaboration with other members of the international community, to ensure the peaceful nature of the electoral process,’ says Lori-Anne Théroux-Bénoni, who drafted the Guinea-Bissau analysis in the PSC Report. Several issues threaten the peaceful conduct of the poll, including the question of whether Gomes Júnior, who has been living in exile, will return to run for president. Gomes Júnior is feared in some quarters because of his strong links with Angola, the powerful oil producer that provided military support before the coup. If he does come back, he might not be allowed to stand because of his long absence: the electoral laws state that a presidential candidate has to reside in the country. Another potential destabilising factor is the army, which is infamous for its control of politics and business in the country. High-ranking officers have been implicated in several drug-trafficking scandals, and the few politicians who have tried to oppose them have, at times, paid for it with their lives. The military elite are still smarting following the spectacular arrest at sea of former navy chief of staff, José Américo Bubo Na Tchuto, in April last year. The sting operation by the United States Drug Enforcement Agency caused a huge uproar, with the United States (US) being accused of ignoring Guinea-Bissau’s sovereignty. General Antonio Indjai, head of the armed forces, has for now escaped capture by the US. He has been indicted by US courts for drug trafficking and narco-terrorism. Political parties, meanwhile, are either facing internal power struggles or appear weak and divided. The dominant African Party for the Independence of Guinea-Bissau and Cape Verde (Partido Africano da Independência da Guiné e Cabo Verde [PAIGC]) has decided to elect the former executive secretary of the CPLP, Domingos Simões Pereira, as the chairman of the party, in the absence of Gomes Júnior – but has still not announced who will stand as presidential candidate. The only real opposition would come from the Party for Social Renovation (Partido para a Renovação Social [PRS]), dominated by the Balanta ethnic group. Former president Kumba Yala is not running, even though he was the dominant figure in the party. In January, 20 other parties with very small representation in parliament joined hands to launch the Forum of Guinea-Bissau, but seem to have little chance of toppling the PAIGC. Initially, the international community was divided about whether to sanction or to cooperate with the regime that took over after the coup. Yet, since the formation of an inclusive government in June 2013, there now seems to be consensus that everything possible should be done to make sure elections go smoothly, states the ISS’s PSC Report. The PSC has been seized with the crisis in Guinea-Bissau ever since the coup d’état and has issued a number of statements, including one on 13 December last year, condemning human rights abuses and ‘the persistence of a culture of impunity in Guinea-Bissau’. This followed the attack on the Nigerian embassy in Bissau by gunmen in October, in which one person died. Though the AU and its Commission Chair, Nkosazana Dlamini-Zuma, have spoken out about the situation and the AU suspended Bissau after the coup, it ultimately fell onto ECOWAS to handle the issue. Tensions between the AU and ECOWAS have arisen over how to treat the crisis, as has been the case in a number of other political crises in West Africa. ECOWAS supported the establishment of a transition ‘in contradiction with the principle of zero tolerance enshrined in its Protocol on Democracy and Good Governance,’ notes the ISS report. Meanwhile, ECOWAS is now stepping up to the plate to pay for the elections. One of the reasons for the constant postponement of the voting was that the country does not have the funds needed go to the polls. So far, ECOWAS countries have contributed US$13 million to preparations for the elections, with US$6 million provided by Nigeria. The West African giant also donated vehicles and voter registration materials. Interestingly, CPLP member East Timor has also been supporting the country with an estimated US$6 million. ‘The efforts of ECOWAS in resolving the crisis were influenced by some of its member states, in particular Côte d'Ivoire, Nigeria and Senegal, based on their respective national interests, which were preoccupied by the presence of Angolan troops in a country of the West African region,’ states the ISS report. The European Union has now also agreed to fund the process with up to €2 million through the United Nations Development Program. Ultimately, military reform is one of the key issues going forward for Guinea-Bissau and ECOWAS, through its peacekeeping force – the ECOWAS Mission in Bissau (ECOMIB) – is pledging to spend a further US$36 million on security sector reform. 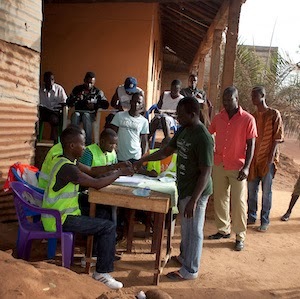 ECOMIB, which has over 500 personnel, is also tasked with ensuring that the elections are held in a peaceful atmosphere. In its report, the ISS researchers recommend that the PSC ‘should not lose sight of the post-election challenges’ and that it should support ECOWAS. The mandate of ECOMIB should be extended and it should be given the necessary financial and technical support to ensure stability not only in the run-up, but also after the all-important 13 April polls.